Definition at line 447 of file directedLine.cc. Definition at line 407 of file directedLine.cc. 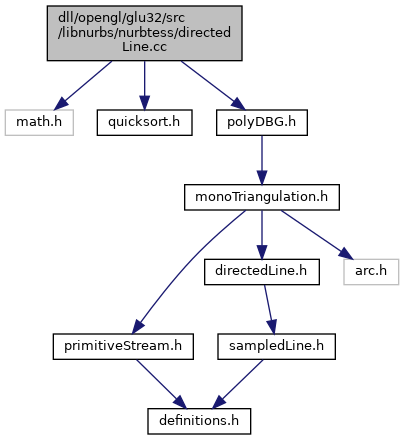 Referenced by DBG_is_U_monotone(), findDiagonal_singleCuspX(), is_u_maximal(), is_u_minimal(), isCuspX(), monoTriangulationOpt(), monoTriangulationRecGenOpt(), and sampleMonoPoly(). Definition at line 399 of file directedLine.cc. Referenced by compChainHeadInY(), findTopAndBot(), monoPolyPart(), monoTriangulation(), monoTriangulationOpt(), monoTriangulationRec(), monoTriangulationRecGen(), sampleMonoPoly(), Slicer::slice_new(), and triangulateConvexPoly(). Definition at line 106 of file directedLine.cc. Definition at line 792 of file directedLine.cc.